Walker Filtration's autoclave filters are recommended for use in sterilizing atmospheric air entering hospital and critical use clinical or laboratory sterilizers during the vacuum break cycle. Our autoclave filters use high efficiency filtration with 100% sterilizing efficiency, ensuring that the air entering the sterilizer/autoclave is of the highest quality. Clinical sterilizers using high temperature steam are by far the most common sterilizers used, due to their superior performance as sterility. They are specifically designed to process medical devices, medicinal products and other goods and materials used in the clinical care of patients or laboratory sterilizers. 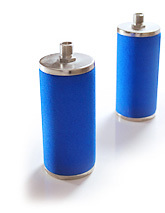 Designed and constructed to an exceptionally high quality standard, the autoclave filters remove solid and biological particles down to 0.01 micron. The efficiency exceeds that of conventional HEPA filters and has been confirmed in accordance with BS 3928 Sodium Flame Test with a penetration of less than 0.001%. All filters are also integrity tested prior to dispatch. The thread connection has a critical orifice controlling the air filtration velocity, meeting the requirements of BS EN 285.